Copyright 20th Century Fox, Hard Eight Production and Glen Morgan & James Wong; no copyright infringement intended. The USS Saratoga meets heavy resistance and is in a tight battle with the Chigs. Although the humans use all their fire power, they are soon outnumbered. McQueen does his best to co-ordinate the point to point shooting. After another attack of the Chigs, one of their red bombers hovers unmovingly on the bow of the 'Toga. The 58th are briefed by Navy techies on the specifications of the craft. 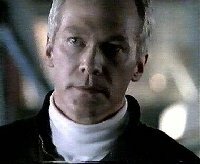 McQueen cuts them short and tells them that the Wild cards know what they have to do and sends them into the bomber to retrieve it. 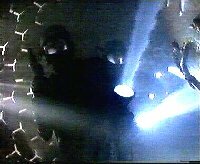 The 58 prepare to search the Chig craft. Vanessa Damphousse is doing her anti stress training and Shane looks on somewhat unnerved by it. Once inside the Chig ship Shane gets attacked by the sole survivor of the crew but Hawkes dismembers the Chig. The space ship looks strange, like a hive and is illuminated by strange white-blue light. The spacecraft is brought back to the Saratoga where Aerotech technicians already await the salvage and set to work examining the craft. Colonel McQueen and the Wild Cards are troubled that Sewell is there as well. While Cooper diverts the technicians, Paul sneaks in behind the back of the techie and *nicks* a portable computer pad with information of the Chig craft. He shows the information to McQueen, realizing that Aerotech has already found out about the destination of the craft - the Chig home planet. 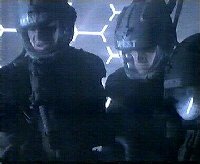 At the Commodore's cabin, Ross and McQueen discuss the Colonel's plan to use the Alien spacecraft as a Trojan horse to destroy the home planet of the chigs. 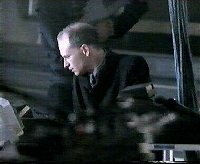 Ross doubts that the mission is a valid one, thinking that the Colonel is foolhardy even thinking about such a kamikaze mission. But he agrees if McQueen can get volunteers.